WordPress released a nice little function this week which allows you to embed tweets with a blog post. This can increase social sharing of your content, particularly if you have a loyal following of users. By simply inserting the URL of a tweet e.g. into the body of your blog post, the tweet will be magically transformed into a sharable tweet on publishing the post. There used to be plug ins for this functionality but now it is native to WordPress to incredibly simple to use. How do you find the URL of an individual tweet? 1) Go to Twitter and find the tweet that you want to embed. 2) Just below the tweet there will be a small piece of text that says “Expand” – just to the left of “reply”, “delete” etc -you need to click on this. 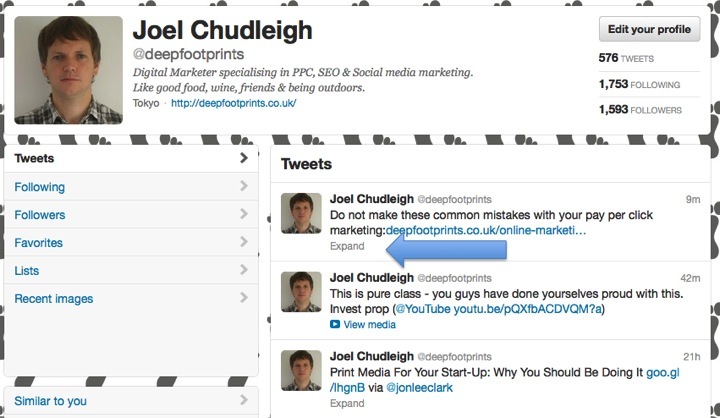 4) You will now be on a page just showing the individual tweet – copy this URL to your clipboard. 5) Paste the URL into your blog post in the relevant place.